Each member of your family has a bucket. 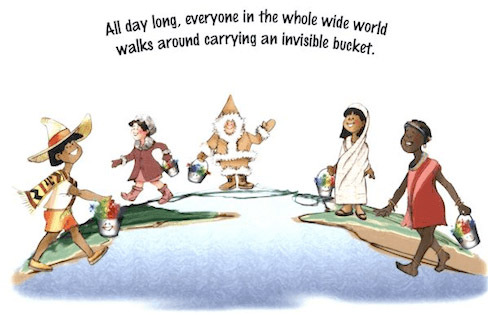 Synopsis: In this beautiful book, children are encouraged to express daily kindness and love. 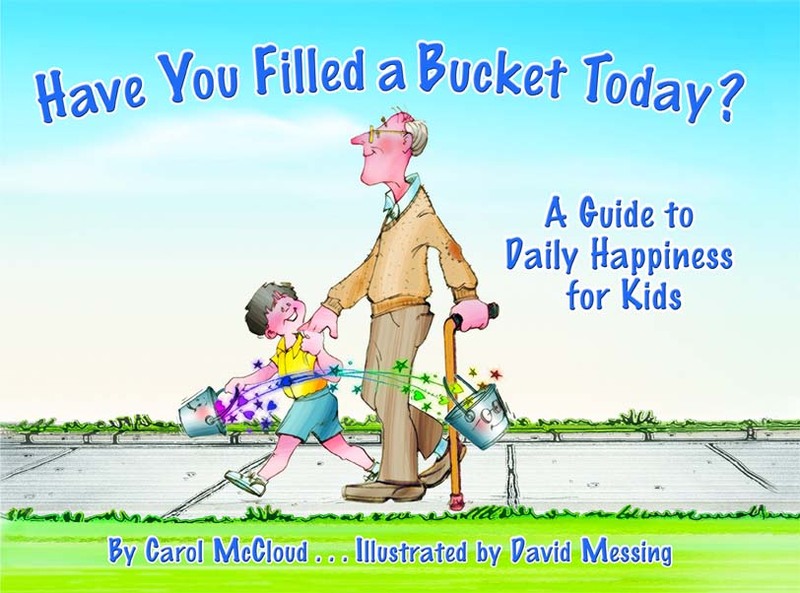 The author uses the metaphor of every person being born with an invisible bucket, which represents their emotional health (or happiness quotient). 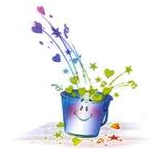 By saying kind words to others, not only will you fill their buckets, but you will fill your own. Why I Like This Book: The language is simple and to the point. The illustrations are bright and cheerful. And most importantly: My class of six-year-olds got it! They completely understood the concepts and could relate them to their own lives. The children loved the first reading and cheered when I said I was reading it again. Several of them have asked to look at the book during buddy reading. 1. My students wrote happy notes to half the class (I made sure everyone received close to the same amount of notes ~ I say "close", because we have an odd number so some children received an extra). Then they decorated their own buckets with felts and glitter. 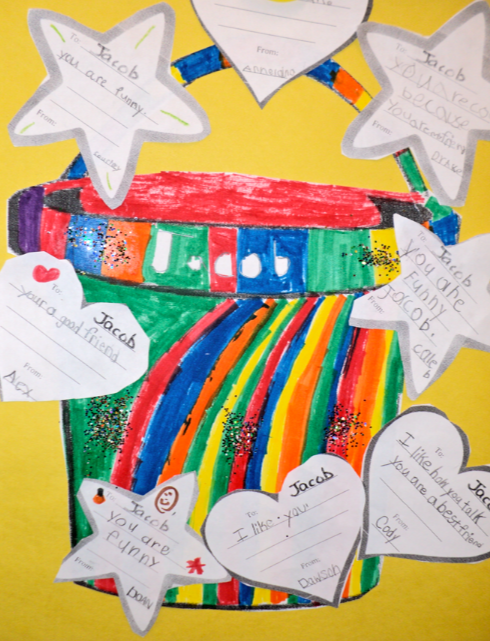 They delivered their notes, everyone read them, then glued them onto their buckets. This was a HUGE success. 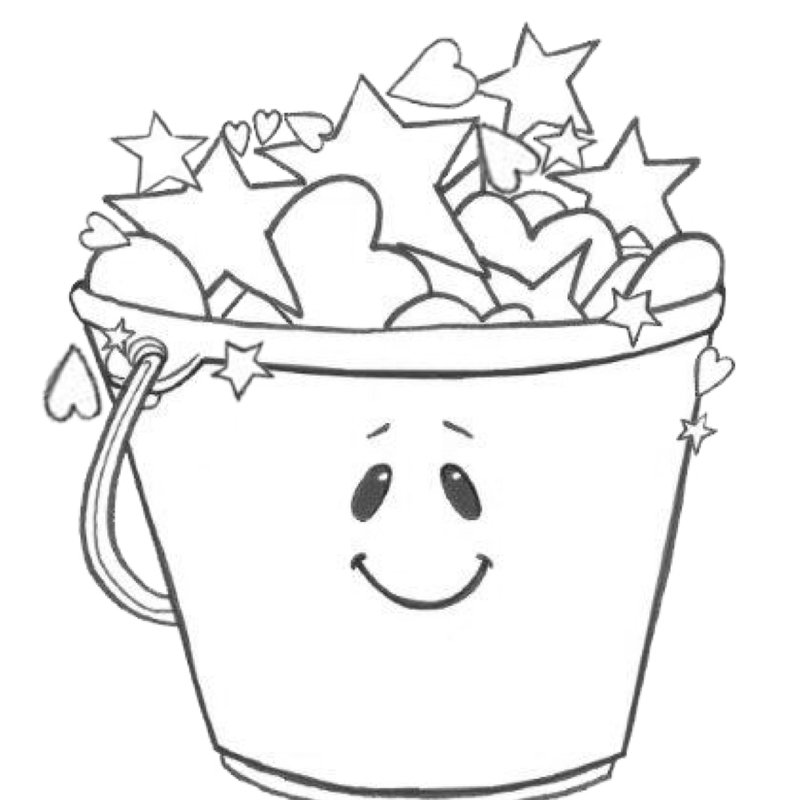 You can download the masters for the bucket, hearts and stars here. 2. 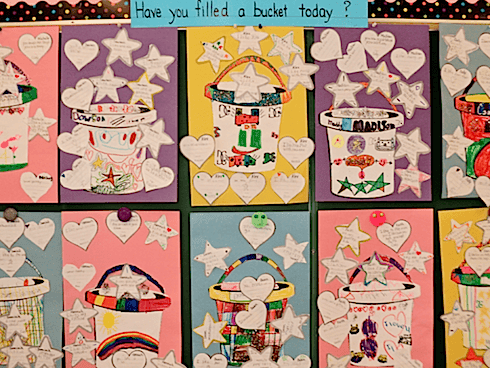 You can brainstorm ways in which children can become bucket fillers. 3. 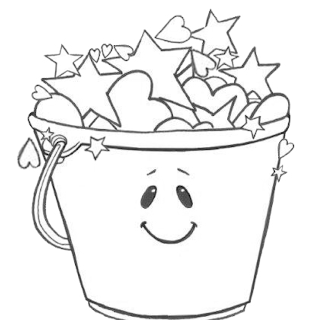 Each child could receive their own bucket and collect pom poms to represent their kind deeds. Scholastic describes it here. Personally, I don't do that, only because I don't like to use extrinsic rewards too much. I think the most important reward for being a kind person is the boost in your own self-esteem and happiness as you witness the positive impact of your loving actions. I would prefer to discuss this with the children on a regular basis, rather than just have them collect tokens. 4. Here's a link to a colouring page. 6. Both of the above activities can be found at Bucket Fillers 101, where you will find lots more activities to choose from. I absolutely love the bucket filling initiative. I use it in my classroom and the students have actually become more aware of how their actions can have a positive or negative outcome. They say things like "Danny filled my bucket by helping me spell a word". 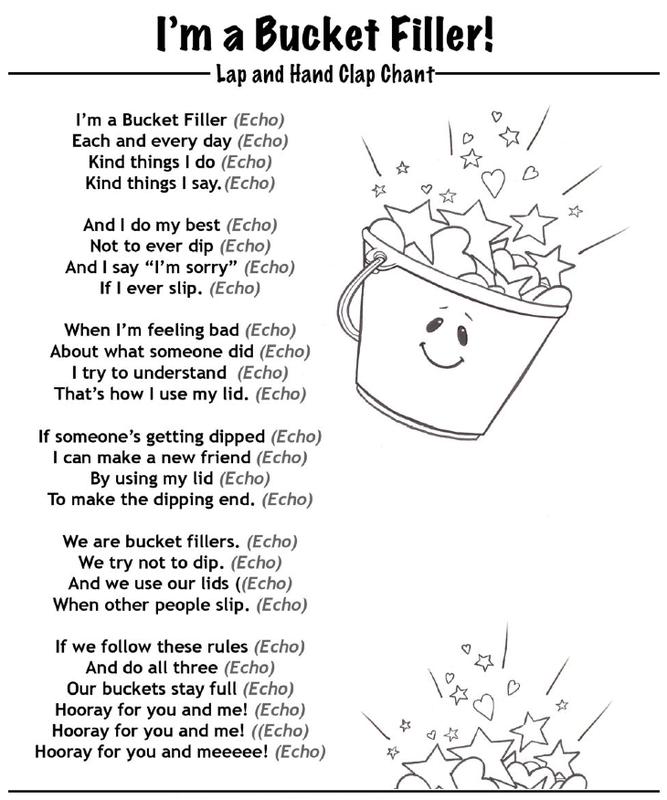 They each have a little bucket (paper bag) attached to their desk and we leave "bucket filler" notes for each other. I like the idea of leaving notes on an on-going basis. Thanks! I love this book, and so do my kiddos! Thanks, Jen and Megan. I know this book has been around awhile. I'm not sue why it took me so long to actually read it. I read it at my workshop in Puerto Rico this week . . . they LOVED it . . . great news . . . it's coming out in Spanish and French on April 20th!!! Barbara, I absolutely love this book. Glad you used this version. I reviewed it last summer and was hoping someone would post it as a PPB. I really believe kids get it and there are so many resources and activities. Great classroom activity. I happened to see a journal in B&N yesterday that accompanies the book. I have even used this with adults. Absolutely the perfect choice! Yes, I can see how it would be a great book for adults, too. I've read this book! It is really great! 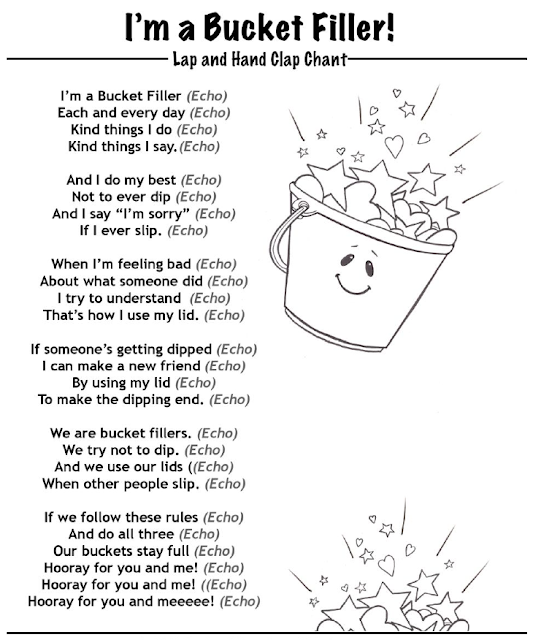 We did that bucket activity in my second grade class. It was a really nice thing! Great PPBF choice! That is adorable and what a great craft to do to go with the book. Super choice! Great book! Thanks for the downloads. It's so important to foster this kind of sharing and caring. I love this book. I too believe in intrinsic rewards, but I also think this book and the activities really help making this concrete for kids. 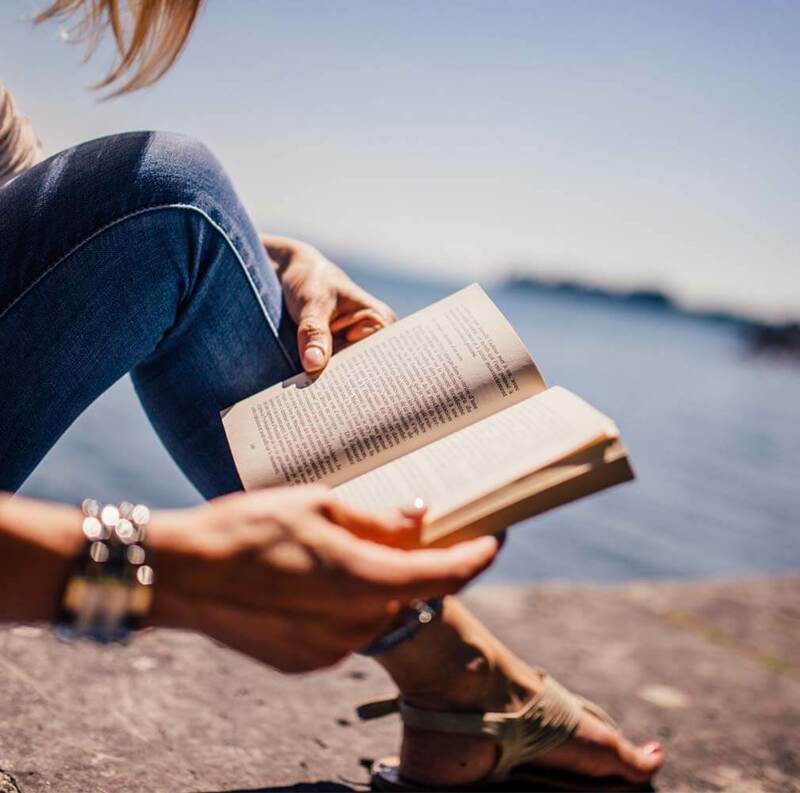 Classroom culture can really make or break a year. Thanks for everyone's kind comments. I appreciate them!! I love using this book, so the chant is perfect because it keeps the whole message fresh in students' minds! Thanks for sharing- I'm sure my kids will love it!!! I'm glad it's useful, Karli. Thanks for stopping by!